For so many of us September 11, 2001 does not seem over a decade old but still a memory that is clear and visual as if it happened yesterday. I would like to share my story in the wake of 9/11 this Tuesday. I remember it like yesterday. I was shooting for either Marie Claire or Mademoiselle editorial spread and I was running late for an 8:45 AM call time. I know this is silly but before I left to head out to the shoot, I had heels on and all of a sudden I had an extremely strong urge to wear flats, I have no idea why and it seemed ridiculous at the time but I’m glad I listened to my intuition, because little did I know I would have to walk from 23rdst to Queens to stay with a friend since all subway lines were temporally terminated due to 9/11. The studio where I was shooting was located on Chelsea Piers in New York right by the west side highway. I lived in NJ at the time so I was taking the bus to 42nd and Port Authority and did not need to leave the bus terminal since there was a subway station located inside. I took the train to 23rd street and walked to the Westside Highway. As I was walking I noticed something immediately strange…there were surges of people walking through the streets with a state of urgency. Now of course this is nothing new, this is New York and everyone is on the move but what made this day peculiar was everyone was coming from one direction. No one seemed to be heading downtown, only in the uptown direction. Since I was running late I assumed there had been a fire somewhere because I could smell the distinct smell of smoke and hauled my a@s to try and make it to the set on time. When I reached the studio about, 10 minutes pass my 8:45AM call time. Everyone seemed preoccupied so I went straight for the food that was set up for breakfast before I headed into hair in makeup. I was STARVING and this is why it took me a minute to notice the energy in the studio was drained, to say the least. As I finished loading my plate and proceeded to find the editor and style team to say hello, I saw about 10 members of the crew staring out the window in a complete silent daze. Now the studio I was shooting at is known for its amazing panoramic view of the city because of the floor to ceiling glass windows, including a distinct view of both twin towers. As I am walking over to the window, I notice pitch black smoke coming from the North Tower and all I could mutter was “what happened” just before anyone could answer I saw a plane headed for the South Tower. I was in such shock I couldn’t even comprehend that the plane would impact the Tower but it did and automatically I shut down and just remembering robotically reaching for my phone to get in touch with my Mom, sister and friends who were all in the city. My Mother and Sister weren’t supposed to be in the vicinity of the Twin Towers that morning but I wasn’t sure. Due to the high volume of calls and line failure due to the incident I couldn’t get through (eventually most lines would be out of service) but the only thing that kept me sane was I refused to believe they were harmed, I refused, it was actually the only thing that kept me calm…the only thing. For safety reasons everyone stayed and tried to get in touch with loved ones. As everyone was making phone calls staring out the window in horror that is when the first tower goes down and any hope I had for a huge survival rescue mission for the thousands trapped was stamped out in seconds. During the collapse of the first tower I was in the studio desperately trying to get in touch with my family, and that is when I heard a tumultuous sound that is hard to describe till this day. The sound I heard was the South Tower collapsing. About 30 minutes later I would witness the collapse of the North Tower…I will never forget that image, never. Soon radio accounts were announcing that the incident was intentional and other incidents that occurred in DC and Pennsylvania, and I begin to really fear for the safety of my Mother who was working one block away from the Empire State building at the time. Hours later I eventually reached my family and friends who were all safe. To the thousands that passed they will always be remembered and to the survivors, family and friends who lost a loved one, nothing can really describe the courageousness and strength they possessed that day and continue to possess. One story that hits close to home was a friend of the family who worked in the World Trade Center and felt ill that morning and called out, all friends and employees of his company perished in the attack. My story really pales in comparison, in fact I wouldn’t even dare to make an comparison to the horrors and atrocities that happened that day and the losses that so many are still dealing with till this day but it is my memory and something I will never forget. 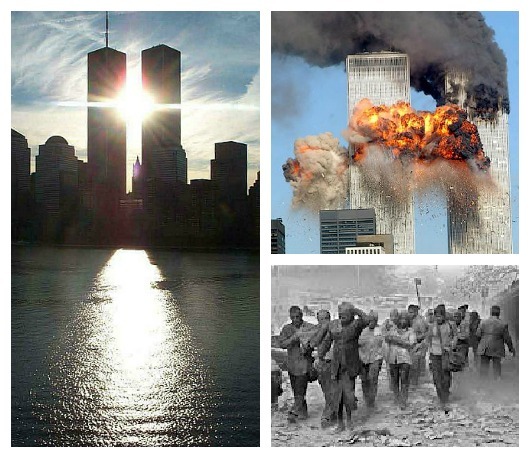 Where were you or what was your 9/11 memory? Olympian Gold Medalist Gabby Douglas and her ponytail: what’s all the fuss about? I was living in DC at the time. All we kept hearing were rumors about bombs going off at the State Department or Congress, black smoke from the Pentagon funneling upwards for a week afterwards, military tanks with soldiers and rifles standing on street corners, and walking to my boyfriend’s apartment while wondering what was happening as the city became a dark, terrifying place to be. I was stationed over seas in Guam. There is a 14 hour time difference so it was actually 9/12 and it may have been midnight by the time anyone that was on my ship knew anything about it. I was living on onbase housing and people was getting phone calls, or someone was running around knocking on doors telling what h ad happend. Naturally no one wants to answer their door or phone at 2am especially if you have to be up my 6am. So of course my roommate wakes me up to tell me that the US had been bombed. I was like “Yea right, no one is crazy enough to attack the US!” So after so much auguring having people still calling our house I just got up and turned on the news. I could not believe what I saw on the screen…. I was in freshman study hall that morning. Kid runs into the study hall, frantically grabs a chair and hits the tube, watching replays of the first plane, and then seeing the second live. We found out that one of the planes was either heading for or coming from Chicago, of which a classmate’s parent was thought to be on…but he happened to have missed that flight by the grace of God. As we are in Chicago, my mother worked across the street from the Sears Tower building at the time and I was concerned for her, because something told me that if they flew into the World Trade Center, they would fly into the Sears Tower. They did evacuate the city, and there were claims made on the tower…but it was a wild few weeks because of that horrifying day. I was about to switch classes in 7th grade. Our secretary came over the intercom and asked us to pray (it was a Catholic school) for people involved in a plane crash into the Twin Towers. A boy in my class remarked that it was strange that a pilot could fly into a building as we went over to the next room. In the next class, our teacher was crying, and we watched the news in silence instead of doing math. A girl in my class was also picked up by her mom, and it turns out the girl’s soon to be aunt (her uncle was waiting for her to come home to propose) was a flight attendant in one of the planes, and was killed. It was surreal even to see it on TV, and even until now it rends my heart to think of what the people who had people they love in that building felt and continue to feel. I pray for them often. Thank you for sharing you story. 11 years later, and not even being a New Yorker, it brings tears to my eyes. It reminds me to count my blessings twice and love every moment individually. My teacher turned on the radio, and the entire class listened to the news. While listening to the news, I heard them say that no one knew exactly what was going on, or how the plane came to crash into the tower. Soon enough, they announced that the second tower was hit by another airplane and that America was clearly being attacked. As I sat there, one by one, my classmates were being picked up by their parents. My mother came soon after and picked me and my siblings up. I remember going home and watching the news for the rest of the day and into the night as. God bless those who mourn the loss their friends and loved ones on that day here in New York, Washington D.C, Virgina, and in Pennsylvania. And my sincere appreciation and gratitude to those who were brave and risked their lives to save many others. I will always love NYC and its living and fallen heroes of 9/11. They are always in my thoughts and prayers. Well I was in the fifth grade and all the teachers were acting really strange, one of my friends had to deliver something to the main office and overheard the secretaries saying something about the pentegon on fire, so we knew something was up but then when recess rolled around they didnt let us go outside at all (I lived 20 mins from manhattan) and then when school was over they didnt let anyone out the building everyone had to be picked up by a parent…a lot of kids parents worked near the world trade center or their parents were fire fighters and police officers so they knew no one would be home when they got home so some kids stayed all night….I thank God that no one in my family was harmed, a close family friend was suppose to have a meeting in one of the twin towers but for some reason everyone who was suppose to be at the meeting had something come up where they had to cancel, a neighbor of mine went to volunteer and ended up getting sick with some kind of breathing disease and died and because of that I agree that insurance should be given to the responders and everyone who was near or at the world trade center that day. I was living in Sacramento, CA at the time. Ex hubby was in the military and in Germany at the time. I was preparing my kids for school when I received a call from a friend telling of the accounts that happened. My world stopped, my kids did not go to school and all I can remember is being glued to my tv for weeks following this autrocious event. My ex husband was stuck in Germany for a week more than expected becaused they’d haulted all travel. Of course, I was concerned for his safety and anyone who had to travel through the airways. Still a fresh memory. I was in the 3rd grade at daycare inSouth Dallas. no one told me what was going on I just remembered being so scared as I watched what was goin on the news. I was in the 5th grade living in NJ, i remember going to the bathroom while in gym class and a boy came to me and said one of the towers fell. I thought he was joking but he said that he was serious so i looked out the window and saw the smoke. At the time i didn’t really understand what happened so i went back downstairs and told my gym teacher that one of the towers fell and now we only have one. minutes later i remember everyone in my second class crying including my fave teacher. He had a brother or someone close to him that worked in the towers (he was safe). School was let out early and i remember the horrible images on tv even at the age of 10 i knew that something bad had happened.I will never forget. I was running a little late for work that morning. I got out of the train station in Union Square and saw everyone just standing around and staring up. I remember saying “All of us are late and everyone’s standing around”, but the eerie silence made me slow down, especially because people weren’t moving. I felt like I was in the Twillight zone. I remember looking to my left, toward the downtown area to see what everyone was looking at, and all I saw was smoke – a fire at the top of the World Trade Center (I’d just exited the train station after the first plane hit), but I didn’t see a plane, just smoke, so I thought, OMG there’s a fire at WTC, let me get to the office (I worked at an ad firm and many of out clients, who were dot.com companies, were in the WTC). All of a sudden a gust of wind hit, the smoke cleared a bit and I could see the hole through the tower and my first thought was that it looked like Godzilla took a bite out of the tower. OMG, so I rush to the office, which was a block away on 5th Avenue, get upstairs, and my colleagues are telling me things that I can’t believe. The receptionist says she was there when the plan passed over the building and she thought it was so strange for it to be so low. I stay calm and start thinking of an action plan, because you see, my baby was only 9 months old at the time, so I stay calm and start planning. Then the second plane hit and I damn near jumped out of my skin. I worked with General Wesley Clark’s son at the time, who was constantly on the phone with his contacts, so the only reason I stayed at the office for a bit was because Wes said stay put, I’ll let you know when to leave. When those towers went down, I cradled my colleague and friend whose uncle was in one of the towers. I looked at Wes and told him I had to get to my baby, and I left! Bought a cheap pair of sneakers on 14th street and walked most of the way home. Walking up Park, seeing military and machine guns and a freaking tank, on a NYC street, and everyone jumping or freezing whenever a helicopter passed by… I kept taking deep breaths and walking home to my baby. I walked all the way to 90th street before finally stopping and crying, because my feet hurt so bad. I’d heard the trains were running again but I refused to get on, but I wanted to get to my baby, so I cried, walked back to 86th street and got on the 5 train headed North, to get to the Bronx, to get to my baby. I prayed the whole time. I spoke in my head the whole time – a conversation with my son, just in case I didnt make it. I hoped that somehow telepathically he would hear me talking to him. I have to stop now… I don’t know why writing all of this still hits me so hard, but I have to stop (plus I wrote a whole novel — sorry to all the UBB readers, I just couldn’t stop). Be blessed everyone, and than you Cipriana for the forum to share. omg, u saying that u spoke to ur baby in ur head made me cry!!! (and im not a crier), i cant even imagine what any of u guys felt or witnessed that day as i live in england but i can magine how u must have felt being so far from ur baby and feeling helpless (i have two young boys, 5 and 1). Thanks for sharing this. I was running a little late for work that morning. I got out of the train station in Union Square and saw everyone just standing around and staring up. I remember saying “All of us are late and everyone’s standing around”, but the eerie silence made me slow down, especially because people weren’t moving. I felt like I was in the Twillight zone. I remember looking to my left, toward the downtown area to see what everyone was looking at, and all I saw was smoke – a fire at the top of the World Trade Center (I’d just exited the train station after the first plane hit), but I didn’t see a plane, just smoke, so I thought, OMG there’s a fire at WTC, let me get to the office (I worked at an ad firm and many of out clients, who were dot.com companies, were in the WTC). All of a sudden a gust of wind hit, the smoke cleared a bit and I could see the hole through the tower and my first thought was that it looked like Godzilla took a bite out of the tower. OMG, so I rush to the office, which was a block away on 5th Avenue, get upstairs, and my colleagues are telling me things that I can’t believe. The receptionist says she was there when the plane passed over the building and she thought it was so strange for it to be so low. I stay calm and start thinking of an action plan, because you see, my baby was only 9 months old at the time, so I stay calm and start planning. Then the second plane hit and I damn near jumped out of my skin. I worked with General Wesley Clark’s son at the time, who was constantly on the phone with his contacts, so the only reason I stayed at the office for a bit was because Wes said stay put, I’ll let you know when to leave. When those towers went down, I cradled my colleague and friend whose uncle was in one of the towers. I looked at Wes and told him I had to get to my baby, and I left! Bought a cheap pair of sneakers on 14th street and walked most of the way home. Walking up Park, seeing military and machine guns and a freaking tank, on a NYC street, and everyone jumping or freezing whenever a helicopter passed by… I kept taking deep breaths and walking home to my baby. I walked all the way to 90th street before finally stopping and crying, because my feet hurt so bad. I’d heard the trains were running again but I refused to get on, but I wanted to get to my baby, so I cried, walked back to 86th street and got on the 5 train headed North, to get to the Bronx, to get to my baby. I prayed the whole time. I spoke in my head the whole time – a conversation with my son, just in case I didnt make it. I hoped that somehow telepathically he would hear me talking to him. Be blessed everyone, and thank you Cipriana for the forum to share. I was working from home on that day. Normally I don’t have the TV on when I work from home but for some reason I turned it on that morning and put it on mute. I saw smoke billowing out of a skyscraper and was trying to figure out what was going on without taking too much attention away from my work…but my curiosity got the best of me and I turned off the mute just in time to see the second plane crash. The next 36 hours just went by in a blur…I was eventually able to reach my friends in NYC and DC but I think I only slept about 2 hours, if that. Ironically the work I’d been doing was for United Airlines and a couple of weeks later it and all other non-critical contracts were cancelled, putting me out of work.